This application replaces the older Microsoft Outlook interface. Please contact us if you wish to use this newer version. 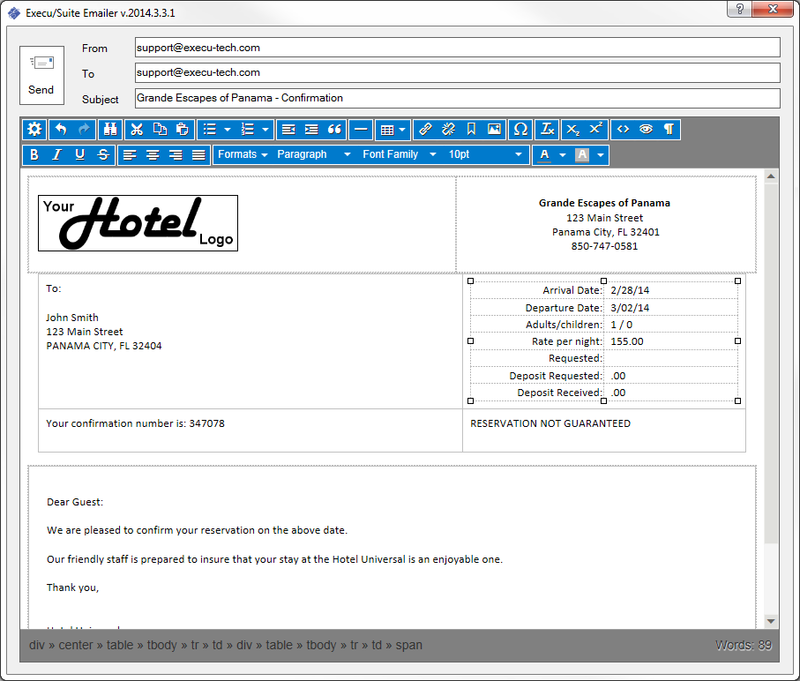 The new ExecEmail is a self contained email editor and sender that removes the need for customers to install Microsoft Outlook. These are the files that are needed for it to function properly. 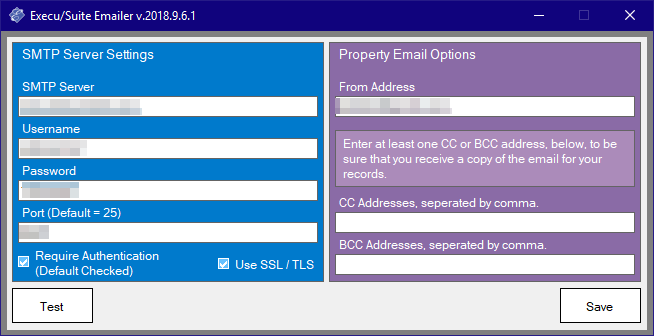 ExecEmail.exe This is the email application that uses the Customers SMTP Server. ExecEmail-Outlook.exe This is the email application that uses MS Outlook. ETHtmleditor.htm This is the template that displays the HTML editor, which allows you to see and modify the email before sending. HTMLEditor This folder contains the HTML editor code, images, etc. If this folder is missing, ExecEmail may not work. Please follow the instructions, below, and install it. You can download v. 2018.9.6.1 of ExecEmail.exe HERE. Extract this file into the PMS software folder. *DO NOT replace a newer version with this one. You must contact your email provider to obtain many of the following settings. Execu/Tech Systems is not your email provider and can't obtain your email settings for you. Your must verify that your email provider will allow SMTP Relay. If they don't allow SMTP Relay, emails will not send. From the Execu/Suite folder, run the program "ExecEmail.exe". If you don't see the following prompt, you're running the older version. This is the settings window. Require Authentication Check this box if your SMTP server requires authentication. Get this information from your email provider. Use SSL / TLS Check this box if your SMTP server uses SSL / TLS (TLS v 1.2). Get this information from your email provider. You may need to have your email provider verify whether or not the from address can be different than the username. A discrepancy can cause a relay error. CC Addresses This is an optional CC address that will receive a copy of the email. This is often desired when you want to keep a log of all emails being sent from Execu/Suite PMS. BCC Addresses This is an optional BCC address that will receive a copy of the email. This is often desired when you want to keep a log of all emails being sent from Execu/Suite PMS. Us this if you want to hide the copied address from the guest. Test This button sends a test email to your "From Address." This allows you to test your SMTP settings. Save This button saves the settings. Sending an email is simple, often as simple as clicking the button to send an email in the reservation or account. You can also choose to display the email first. This allows you to edit the email, change or add to the "TO Address" and change the subject. You can specify a unique From address by Terminal Number. This allows you to send emails from "reservations@" or "activities@", etc. based on the Terminal Number. This only works with the newer, non Outlook emailer. The Outlook emailer uses the user's From Address. Your SMTP server must allow the From Address to differ from the username and password. For security reasons, many SMTP servers don't allow this by default. All email documents sent from this terminal will contain this From Address. ExecEmail can be called with command line arguments. These are the available arguments. Normally, the logo, HOTELOGO.GIF is attached to the email so it displays for the recipient. If you host your logo online, you shouldn't attach the logo. Use this option, followed by a filename, to send a single attachment. The file must be in the same folder as this application an the filename can't have spaces. If you need to send multiple files, compress them into a .zip file first. If the email is visible, you have the opportunity to edit the email. There are only three reasons why ExecEmail will fail and they will usually cause these errors. Network or Internet problems are preventing ExecEmail from communicating with your email provider. Your IT professional can verify this. The email settings are wrong or entered incorrectly. Your email provider can verify the settings. Your email provider doesn't allow relay either because your IP, user or sender isn't allowed. Your email provider can verify this and, if possible, enable it. These aren't all of the errors you may see but they are the most common. In this example, "Mailbox unavailable" could mean that your username or password is wrong or that your email server doesn't allow relay. In this example, the mail server is rejecting the sender. This may be because of a relay restriction or a spam filter. Please check the email settings and contact your email provider if the problem continues. In this example, "Unable to connect to the remote server" likely means that your port number is wrong or there is no SMTP server listening. 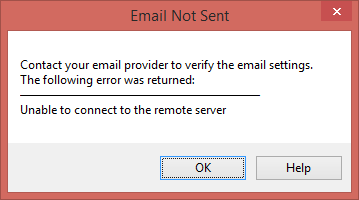 In this example, "The remote name could not be resolved" means that the SMTP server specified in the settings doesn't exist or can't be reached from your computer. In this example, the first part of the domain is misspelled. Outlook must be installed at every computer that needs to email. The only exception is using Remote Desktop, where Outlook needs to be installed at the server with enough licenses for each user. It might be commented out with a # in front of the line, or it might have =NO rather than =YES. If it is commented out, remove the #.